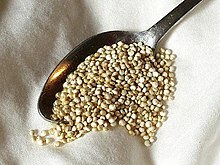 Quinoa (pronounced keen-wa) is a seed (not a grain) originating in South America. The seed heads are naturally pest resistant as the seeds are coated with saponins which must be washed off before eating. The resulting saponin-laden water is useful for cleaning. Quinoa is very nutritious, with a high protein content (12%-18%) and has a well balanced profile of essential amino acids. It is naturally gluten-free, and is a good replacement for people who are avoiding wheat in their diets. Quinoa can be cooked like grains; the taste is mild and slightly nutty. It is readily available from health food stores and many standard grocery stores. Before use, quinoa must be soaked to remove the saponins; this step is not necessary for some packets of quinoa which have been pre-soaked for convenience. Soak quinoa in a bowl or pot, totally covered with water, for 3 to 4 hours, then discard or reserve the soak water, and replace with fresh water to soak a further hour or so. After the soaking preparation, quinoa can be prepared much like white rice. Add one cup of quinoa to two cups of water, and bring to a boil. Lower the heat, and simmer on the lowest heat setting for 16-18 minutes. Set aside off the heat for five minutes before serving. This page was last edited on 24 March 2017, at 17:13.